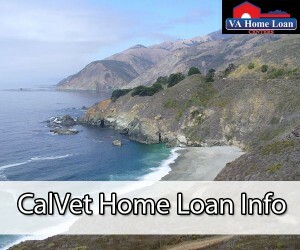 CalVet Home Loans are a great benefit for veterans or active duty looking to purchase a home in California. These loans are designed to make buying a home in California much easier for veterans of all branches of the military, which includes members of the National Guard and Reserve. Spouses of service members might also be eligible for this loan. CalVet Home Loans offer some of the lowest interest rates and require no down payments in most cases. CalVet Home Loans can be received for those buying all types of property, including regular properties, farm land, and mobile homes. CalVet Home Loans can also be used for home improvement and home construction. VA Home Loan Centers makes the process for applying for a CalVet Home Loan quick and easy. You can get started by filling out an application on the VA Home Loan Centers’ website. The CalVet Home Loan is available to most veterans with honorable discharge looking to purchase a home in California. You are not even required to enlist or gain commission in California. The CalVet Home Loan is available to any veteran purchasing a home in California. Certain credit requirements apply as they do for most loans, but the required credit score for a CalVet Home Loan is much lower than the required score for a regular home loan. A minimum of 90 days active duty service, during either wartime or peacetime. It must show on your DD-214 that you received an honorable discharge. “Under Honorable Terms” is also acceptable. Must meet credit requirements of the lender, which in most cases is a FICO score of around 620. The max debt-to-income ratio (DTI) from most lenders is around 35% to 50%. Have you used your CalVet benefits already? That’s not a problem. When it comes to the CalVet Home Loan, there is no limit on the number of times you can apply and receive benefits as long as you have paid off all previous CalVet loans. You can get pre-approved for a CalVet Home Loan by filling out an application at VA Home Loan Centers. Once you have completed pre-approval, you will receive a pre-approval letter. This letter will provide the necessary information for moving forward with your home purchase. The first thing you will see in the letter is the maximum CalVet Home Loan amount you have received. The maximum home purchase price and the current interest rate that you qualify for will also be found in the pre-approval letter. Once you have received your pre-approval letter, you and your real estate agent are free to start making offers on homes. You will be able to show your pre-approval letter to sellers to show that you are qualified to buy their home. Interest rates as low as 3.75% are available to eligible veterans. First time homebuyers who qualify for bond funds may receive an even lower interest rate. Down payments can be as low as 2 to 3 percent of the home purchase price. In many cases, down payments are not required. The only fee required is a 1% origination fee. No additional lender fees are required. The maximum loan for regular properties is $250,000, $300,000 for farm properties, and $70,000 for mobile homes. Keeping your new home protected is important. With the CalVet Home Loan, you will receive excellent insurance benefits to your new home. Insurance benefits offered with the loan can include Fire & Hazard and Disaster Indemnity coverage. A deductible of $500 is offered for all disaster claims. If you are having trouble filling out these forms or need any more information on CalVet Home Loans, contact VA Home Loan Centers. Don’t wait any longer to start the home-buying process. The first step in receiving a CalVet Home Loan is finding out your eligibility. At VA Home Loan Centers, we want to make it easy for you to find your eligibility. One of our helpful agents will help you every step of the way in receiving your CalVet Home Loan. We can be reached by phone at 888-573-4496.